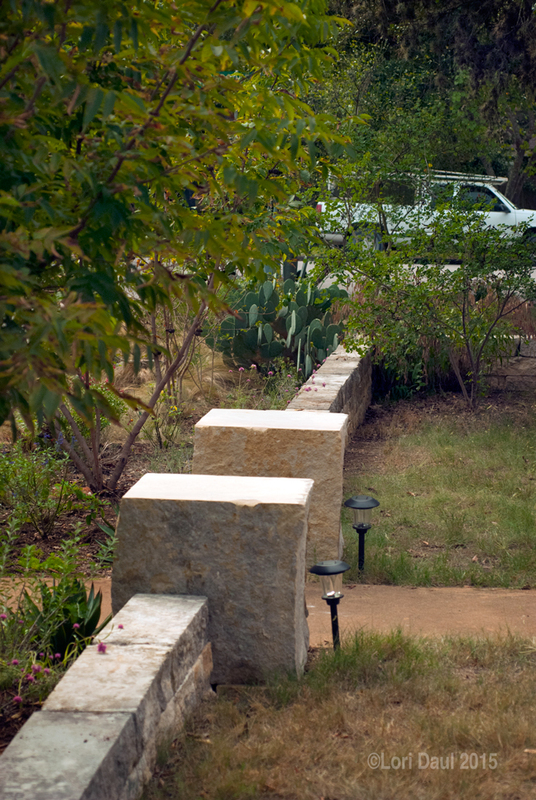 Gregory Thomas’s garden is a fantastic design lesson on how to use hardscape to give a space structure, purpose, and to keep it looking good year-round through the extremes of Texas weather. 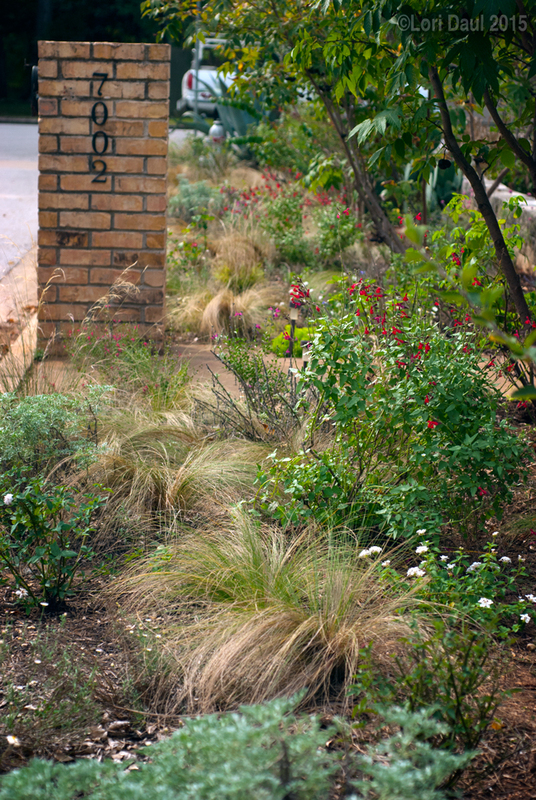 The area closest to the street is planted with tough, reseeding, and mostly-native plants. 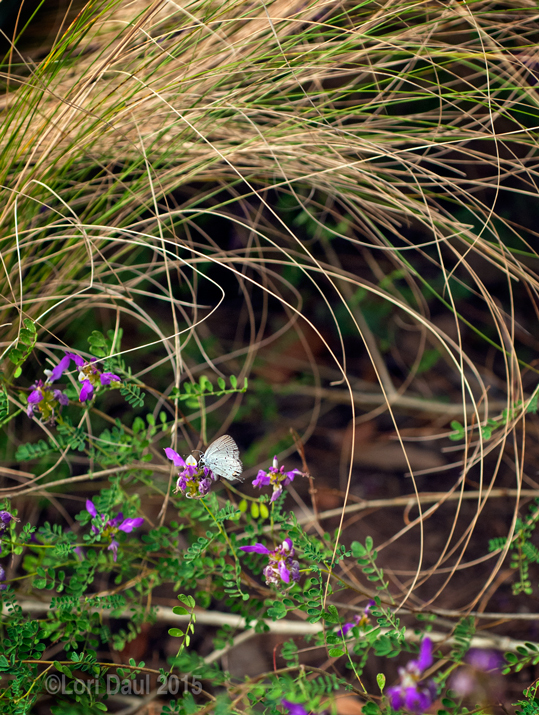 In the spring, it’s overflowing with the wildflowers that make Texas fields so iconic– bluebonnets, larkspur, Mexican hat, coreopsis, Indian Paintbrush, and Mexican feathergrass in all its spring glory. 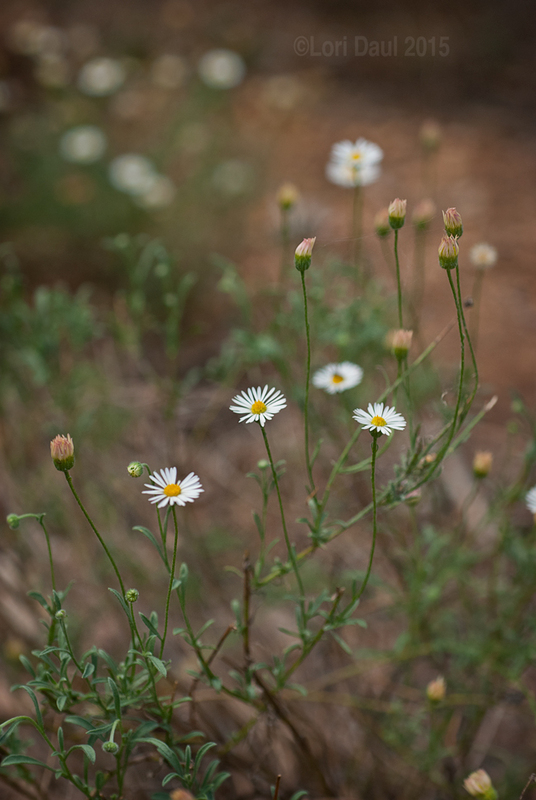 The delicate white flowers of native fleabane cheer up the front garden from spring until frost. Xeric evergreen foliage plants also shine when water is scarce. 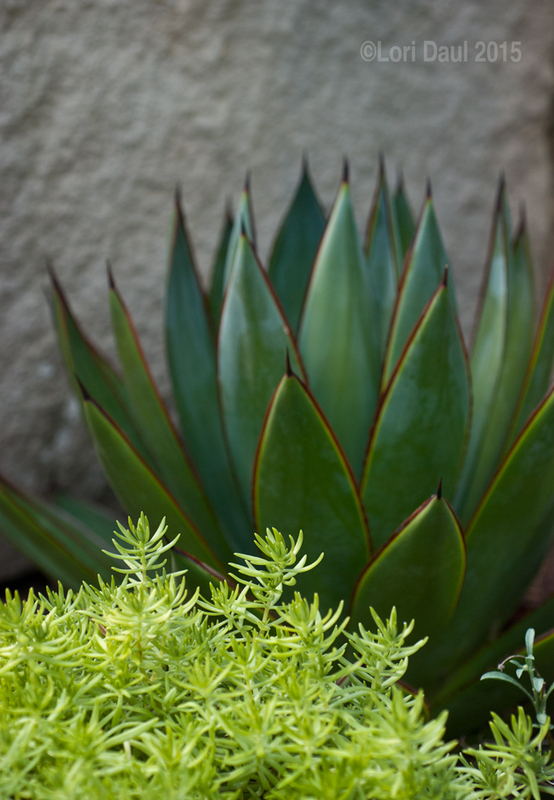 This “Blue Glow” agave and chartreuse sedum make a complimentary pair. To separate public and private spaces, Gregory had a low retaining wall built around his front entry area, which gives it the feel of a courtyard. 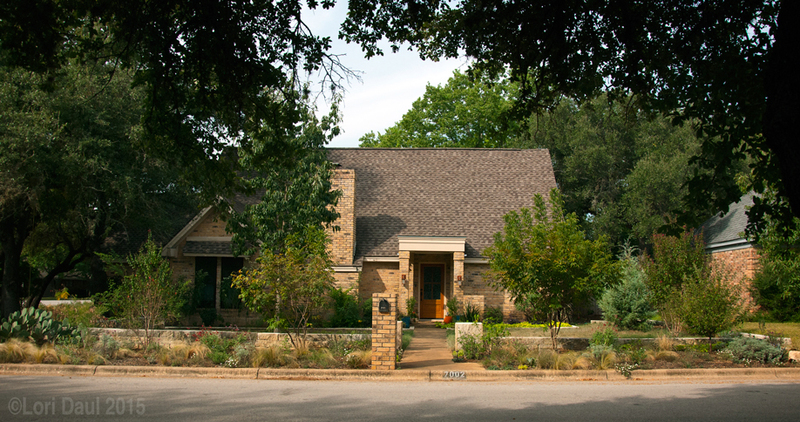 The front lawn area is dedicated to low-water alternatives to the traditional St. Augustine or Bermudagrass lawn and works well as a negative space to rest the eye in contrast to the naturalism of the streetside plantings. 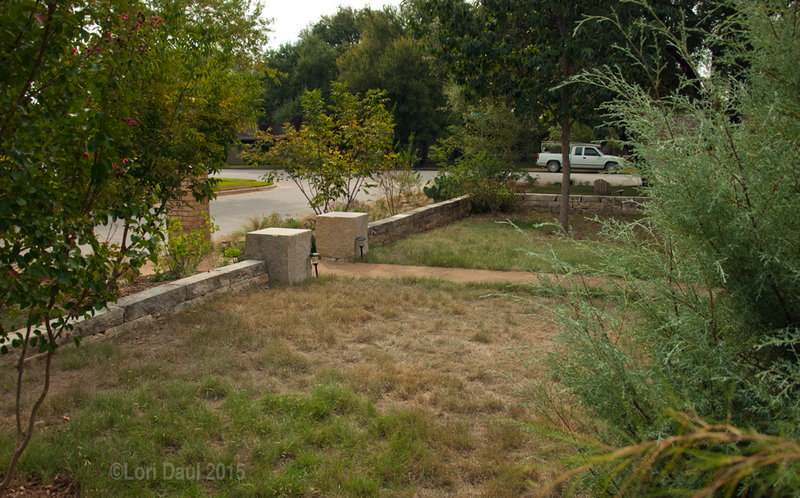 The sunny area to the right of the front door is a buffalo blue grama grass mix. The lawn to the left of the walk segues into a newly-planted sedge lawn as it reaches the shade of an oak. 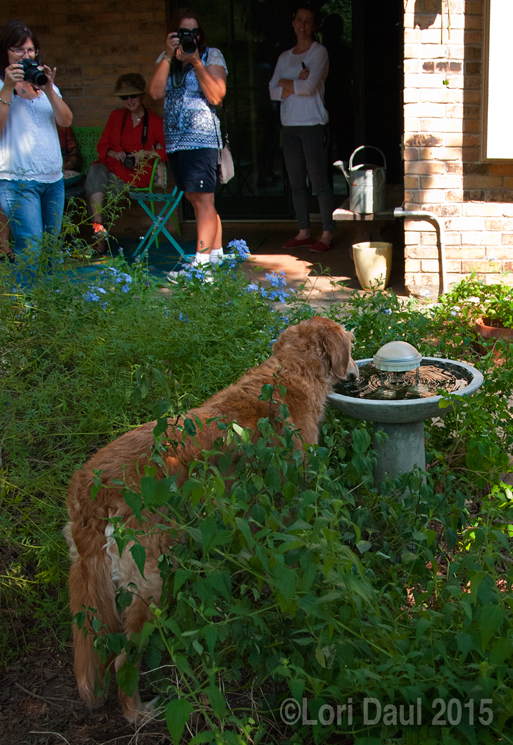 (You’ll be able to see what a mature sedge lawn looks like at Pam Penick’s “Oh, Deer!” garden on the tour.) 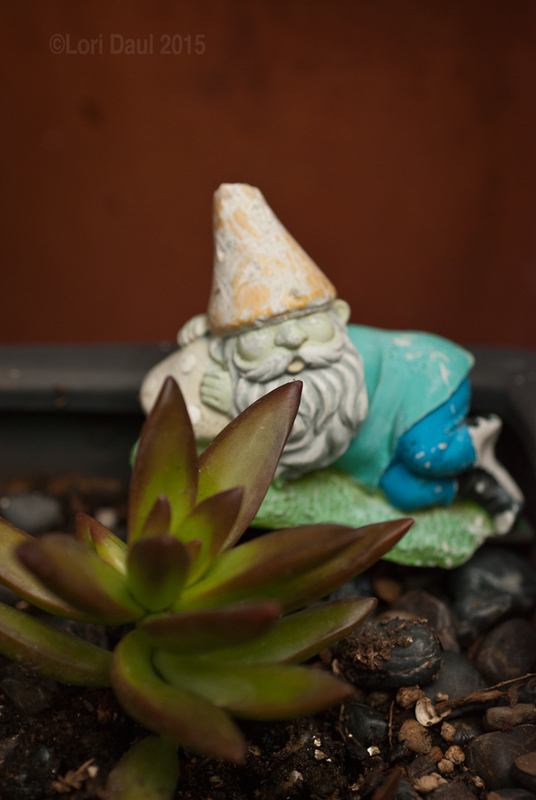 Gregory doesn’t have a sprinkler system and isn’t a a fan of watering, so this lawn area is only watered when getting plants established and in times of extreme drought. 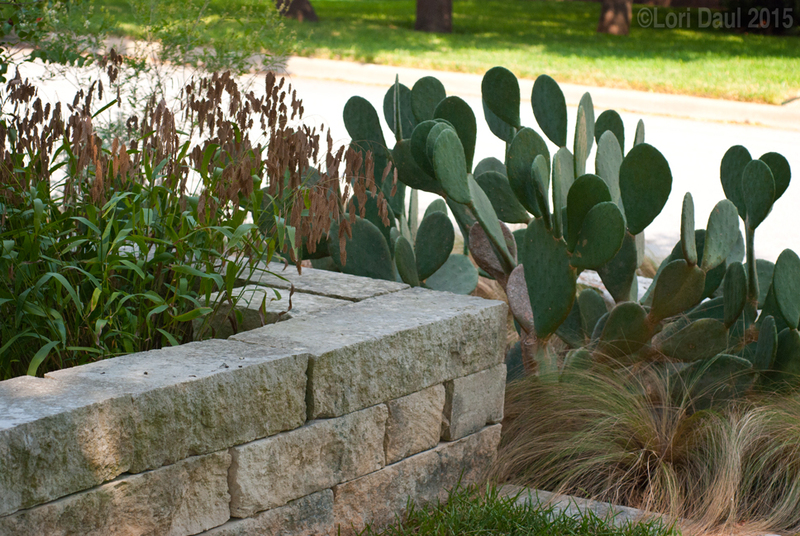 I love how well the hefty blocks of native limestone enhance the Central Texas plant palette and add an element of formality. I also really like the detail of these two squares of limestone bracketing the front walk. 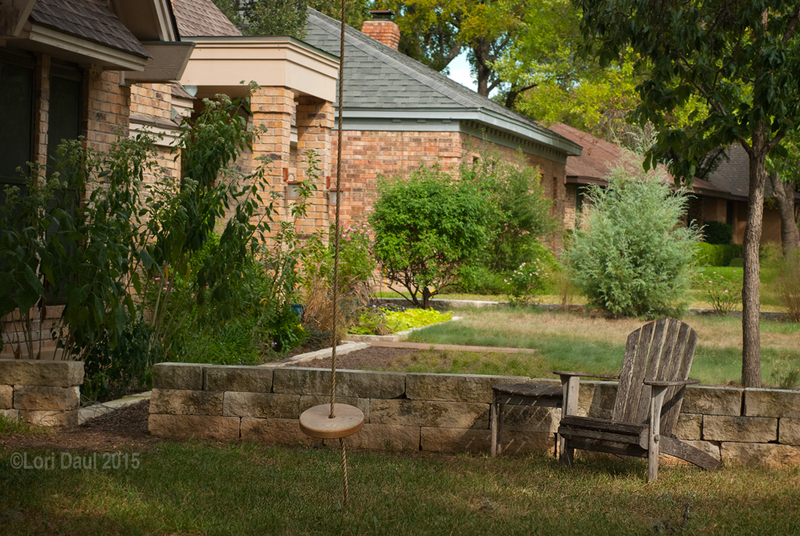 They mark the threshold between formal and informal, public and private, and make a great place to sit while chatting. And if I were a cat, I imagine this would be a primo spot for sunbathing and/or looking down upon lesser mortals. Just outside the front wall, the mood is more casual. Doesn’t this vignette remind you of the rope swings of childhood? I also enjoy the texture of the weathered adirondack against the limestone wall. 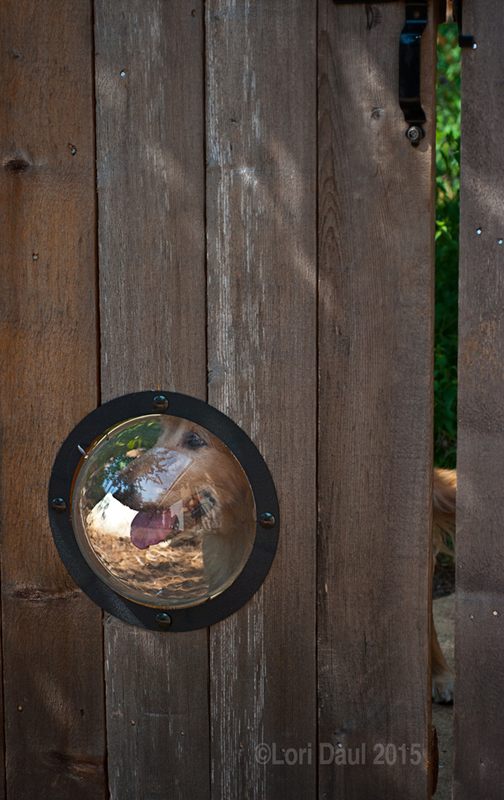 Taking a turn around to the gate into the private back garden, here we find Gracie, World’s Sweetest Dog™, keeping an eye on the world through the doggie-sized porthole in the back fence. The garden is built around a sunny circular zoysia lawn. The clean lines of the lawn help temper the tumble of tough plantings around it. I asked Gregory about his plant philosophy, and he described it as “the most amount of flowers with the least amount of effort, hence my love of roses and wildflowers.” There are lots of tough flowers and trees tucked into this suburban yard, among them plumbago, inland sea oats, mistflower, loquat, coppery canyon daisy, and heartleaf skullcap. 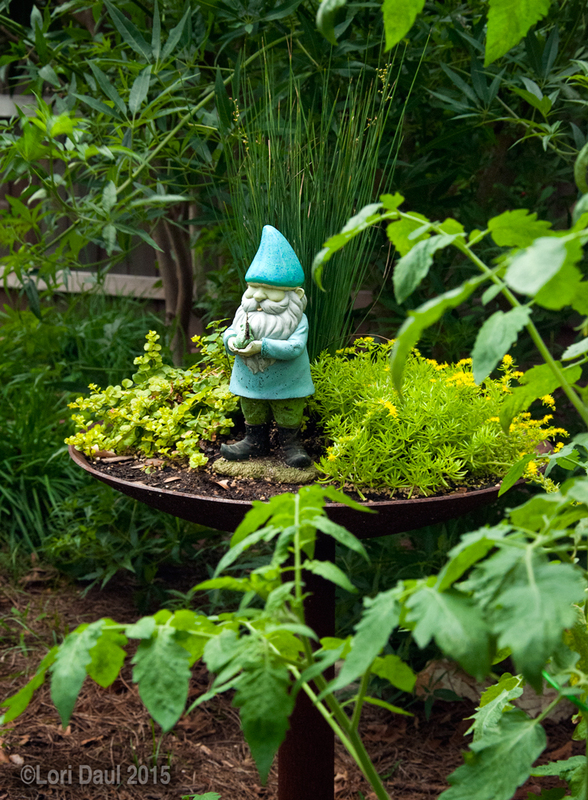 There are rectangular vegetable and herb beds in the sunny spots, and a cheery lawn gnome on an elevated dish planter watches over it all. This shady corner used to be the home of a trampoline. 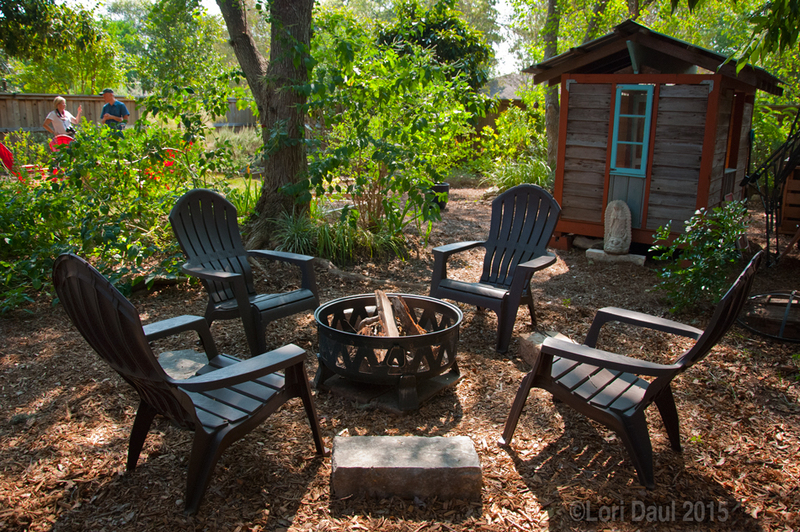 Now the garden’s central circular seating area is echoed by a shady firepit setup. A view next to the playhouse looking back across the garden. 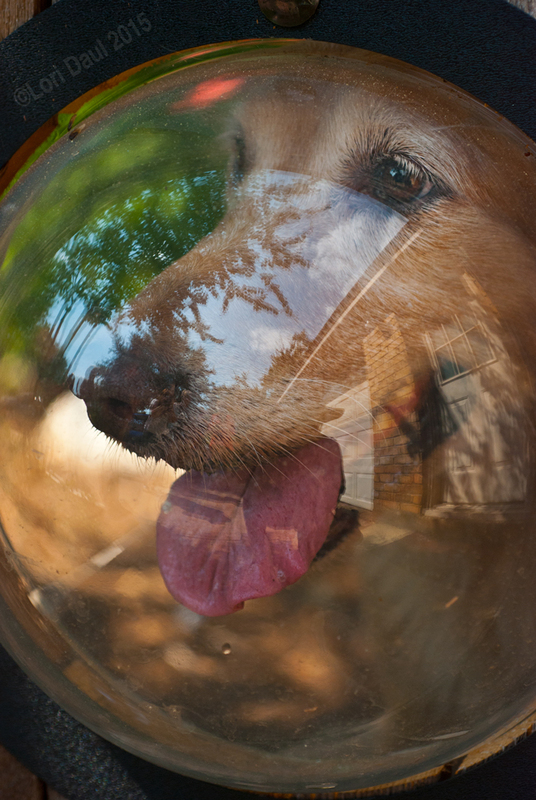 Every bit of space in the back garden has a purpose. 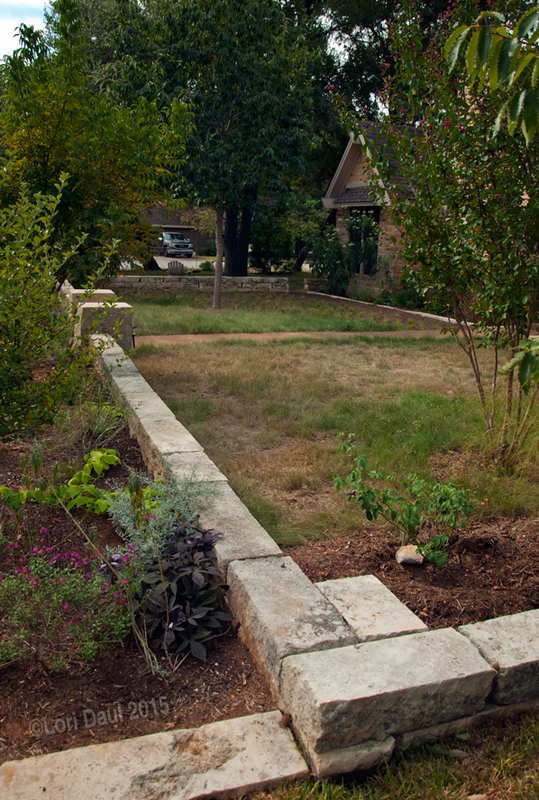 Gregory’s garden is a great illustration of how to design for low water in Central Texas when you don’t have a drip or sprinkler system. He picks tough plants to start with, and then puts the ones that need more water closer to the house and the hose. 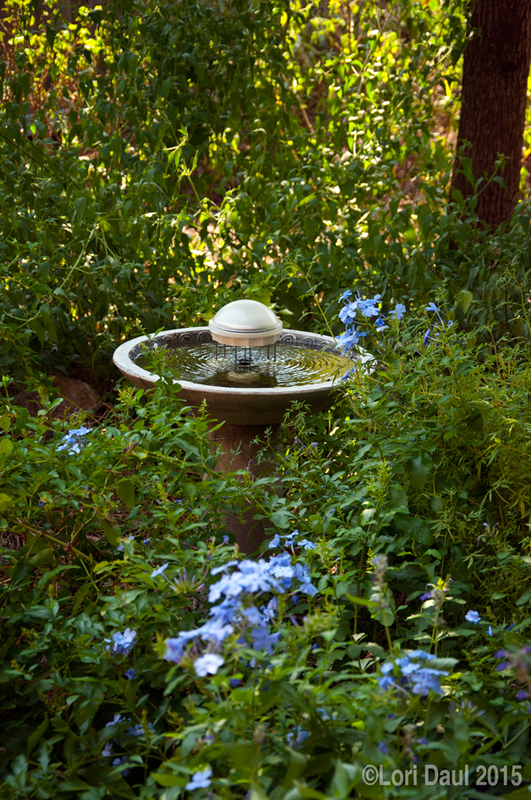 My favorite thing about Gregory’s garden is how it perfectly encapsulates design elements that I think make for great gardens for people who don’t want to spend all their time doing maintenance: enough formality to balance a naturalistic or exuberant planting style, and a thoughtfully-designed, properly-scaled hardscape constructed well out of durable materials. 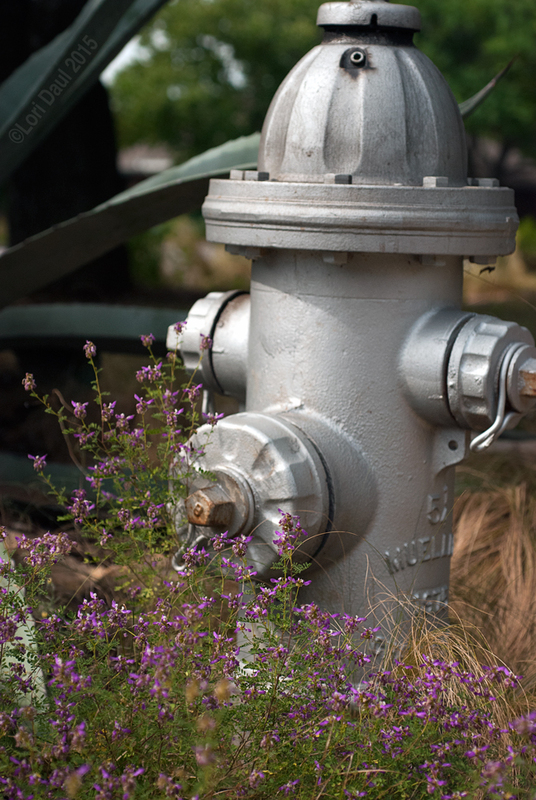 As long as the designated ‘negative spaces’ stay neat and the hardscape is structurally sound, that strong design backbone will balance out a jungle or a less-than-perfect growing season and will keep the garden looking good year-round. And that means more time to actually enjoy the view through the window or from the hammock (or from the top of a sun-warmed limestone pedestal, working on your cat impression). This concludes our tour! 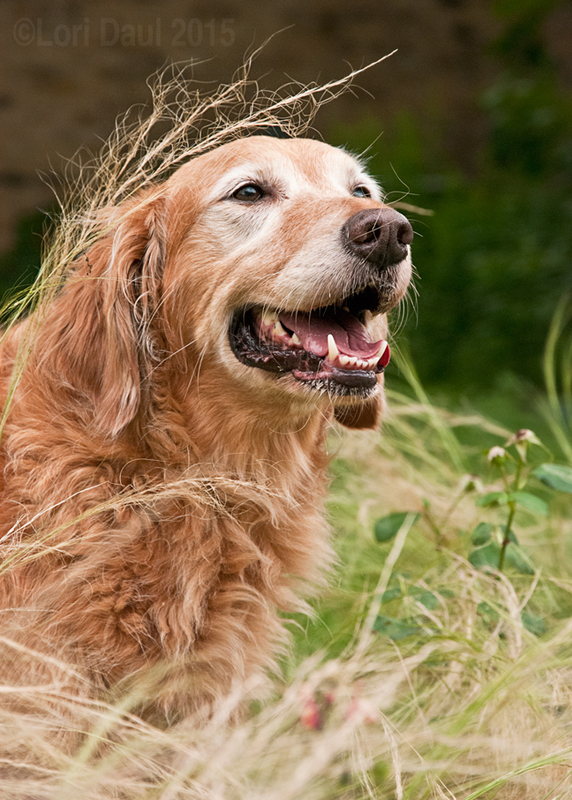 I leave you with Gracie’s smiling face in feathergrass camouflage. 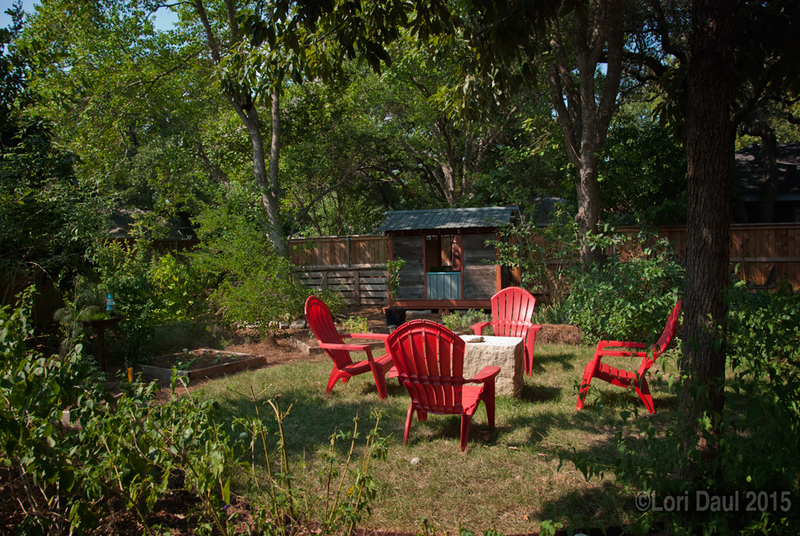 You can read more about Gregory’s garden here or see more pictures on the Inside Austin Gardens Tour website. 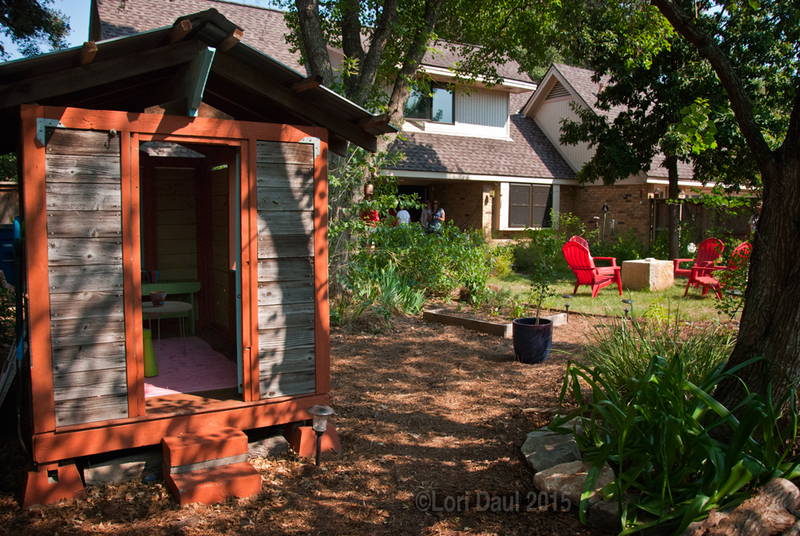 This entry was posted in Uncategorized and tagged garden tours, Inside Austin Gardens Tour. Bookmark the permalink. Great commentary on this garden, Lori. Your text really helps me understand Gregory’s design. 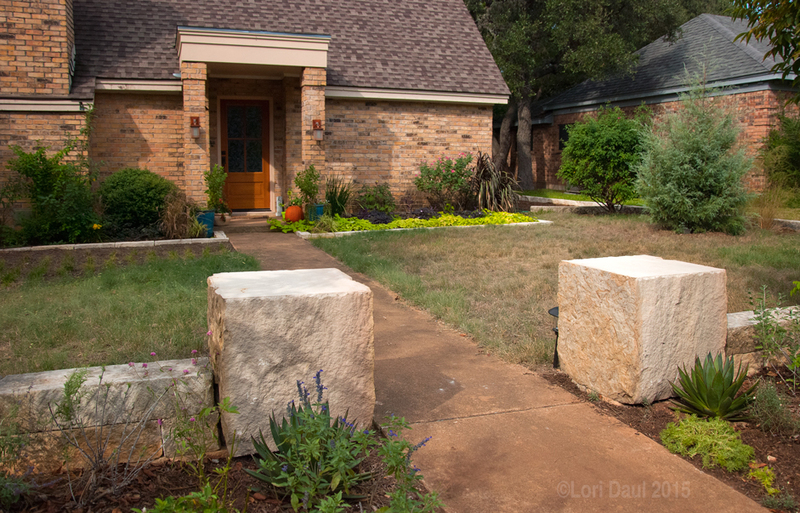 I LOVE those big limestone blocks that act as gateposts for the entry “courtyard.” The garden looks very liveable and inviting.